At this point, for those of you who follow me on Facebook and here on my blog, you all know that I am having laser treatments for my port-wine stain birthmark. In just a few weeks I'll probably be having another one. During the next treatment we're going to do something I don't recall ever doing before - even from my treatments as a child. For the next treatment, I will arrive earlier than usual so they can numb my lip so that my lip will be treatable. That's right. They're going to "beam up" my left-upper lip. When looking at my lips, it is easy to tell that they are not symmetrical. My right lip (the side without the birthmark) is smaller and thinner. It doesn't close all the way because the left side is too heavy and bulky. (This may not be obvious to those of you I only see in the digital world as, just like any woman, I look for my favorite photos - which usually avoid showing that aspect.) If I want my lips to close all the way, I have to make an extra conscious effort for my lips to fully be sealed…and even then my attempt is not always successful. 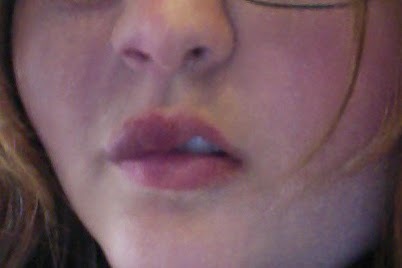 I've asked my doctor about my lip many times in the last couple of years, "Is there anything we can do to help with this?" The doctors have told me that we can treat the lip, but more than likely there are no other options. Many of you ask, "Why do you have the treatments? You're beautiful just the way you are!" While the treatments lighten my birthmark - that's not my overall goal at all. My goal is not, "I'm going to have more laser treatments to lighten the birthmark so I can finally feel and be beautiful!! "…I have never thought like that. I'm okay with my birthmark. Sure, if I didn't have it, I could easily avoid a lot of frustrating situations - but I am okay with who I am…and that includes my "stain". I also enjoy being able to teach others a unique way many people can't. (Although, I’d be lying if I said I didn’t have my bad days.) If you read my post How Light is too Light? ?, you'll know that I struggle with the idea of my birthmark seeming invisible, and knowing how light is "too light". So why do I continue to do these painful and uncomfortable treatments? As I age, my blood vessels in the birthmark grow and enlarge, resulting in a lot of possible issues that can arise. Without the treatments, my birthmark’s color will darken as I age. It can even get larger in size. As the blood vessels grow and expand, my skin can also do the exact same thing, resulting in a pebble-stone type of texture. My skin can also harden because of the vessels and bleed for no apparent reason, once hardened. I am having the treatments to avoid all of this. Once all this happens - if it happens - the damage is done. There is no going back to smooth, soft, and “normal" skin. If I don't do the treatments and the hardening, pebble-stone, and excess random bleeding starts taking place, I can't undo it. Another very likely possibility (that has been predicted by many medical professionals) for my future? My lip will continue to grow. It will continue to droop and sag, even more than it does now. Hence starting the process of treating it. Fun fact? I didn’t know most of this information that until I started to do my own research a couple of years ago. No one told me the risks of not treating the birthmark. This is why I started doing my treatments again. This information has been my motivation in the most painful moments of a laser treatment. When you grow up with a birthmark on your face, many things aren't really explained to you directly. As a baby, I was clueless and things were explained to my parents. As a child, they again, were explained to my parents. As a child, although I was somewhat aware, I still was kind of clueless to my difference and didn’t really care. I knew I was different , that people stared, made comments, and that I occasionally had treatments…but I think I focused on the outward appearance of my difference and not the medical reasons for them. When I was a teenager, I was a lot more aware but again, didn't focus on the medical causes, symptoms, or explanations of it. Anyways…back to the point of this update. Although I'll be treating my lip, the current damage has already been done. It is drooping and the treatments will not fix this problem. That being said, my doctor has recommended me to a plastic surgeon for reconstructive type of surgery for my lip. Let me be clear: I don't want "new" lips. I just want them to be more symmetrical. I want to be able to fully close my lips with ease, instead of having to deal with the facial abnormalities that the birthmark causes. Three professionals (my laser treatment specialist doctor, the laser treatment nurse, and my primary care physician) have told me that the plastic surgeon probably can't do anything to help. They'd probably be unwilling to try because my lip can continue to grow and become heavier, bulkier, and more droopy. If my lip continues to do that, why try to fix it if my lip will later return to it's current state? To summarize: In their opinion, it's practically a hopeless venture. The man was super kind as he measured my lips and assessed them. (I’m pretty sure that’s the strangest sentence I’ve ever written. Seriously.) I really liked the doctor as he really listened and seemed open to what I had to say. I don’t know how this will all go down and how it will turn out. I’m mostly telling you all this as it is a part of the journey. I’ve always been more annoyed and self-conscious about my lip – more than I am with my birthmark (funny, isn’t it? )…but I think it’s mostly because I can’t even close the lips – and because I know the ability to close them will become harder as I age. I think if my lips could do the simple task of just closing, it would be a different story. Having about three doctors tell me that more than likely no surgeon would be willing to operate was discouraging…Yet, the one I saw today was instantly more than happy to do so. I can’t even begin tell you how encouraged I feel after this appointment. While this may not seem exciting to some (and many of you may frown upon it, as I know some frown upon my doing the laser treatments), I am stoked. PS: I’ll update you when I know more – probably in 1 ½ or 2 months, after I see the doctor again about a month after my next treatment. PSS: I still need to write a blog entry about questions some of you have asked me in the last couple of months. I just haven’t gotten to that yet, and I apologize. I have a few more questions of my own to ask my doctor before posting what I have already started, so if you happen to have a question – feel free to ask! I’ll include it. I’m practically an open book about my birthmark, whether you’re curious about the experience, medical technicalities, treatments, or even the emotional and mental processing of it all. For nearly half my life, I was certain that I was meant to go and live overseas full-time. Since I was about 13-years-old, it has always been my dream to travel abroad, pencil, paper, and camera in hand. I wanted to capture what's going on around the world - stuff that the general media doesn't necessarily focus on. I wanted to travel and share the tell stories of those around the world, and to tell of what God is doing with His people. I’ve spent the last 9 years preparing myself for this journey. I’ve travelled, lived overseas, read books, lived overseas, and studied about mission work, journalism, and anthropology. Little did I know…That dream would later be molded to look a little different. The city of where I live has many cultures within its borders. We are a huge melting pot, a huge tossed salad. I have American, Hmong, Mexican, Chinese, British, and French natives as neighbors. Yet, when I thought about working with other cultures, these local culture diversities never came to my mind as a group to work with. It wasn’t until I started to learn about ASL, Deaf Culture, and the Deaf community, that I started to feel passionate about working with a local culture different from my own…A culture within my culture. A cultural group I’ve somehow unintentionally overlooked for most of my life. Growing up, I had been slightly aware that there were Deaf people. The TV show 7th Heaven had a character by the name of Heather in their show. My sister started learning ASL in her late teen years and often signed in front of me, and we had a lady in church who use to use ASL as a ministry in our church. My high school teacher also taught ASL and had an occasional Deaf student come to meet her while I was still at school. It wasn’t until I took an ASL class myself that I really started to see ASL - and the Deaf community. In the past I acknowledged that the language was there, but I really didn’t put much thought into what I was seeing. I was young and had yet to fully be educated on the topic. ASL is a beautiful language and is greatly valued by the respectable and brilliant Deaf community. I accidently fell in love with ASL. Before taking my first ASL class, I was journalism major…And now I’m not. (And I know that change shocked many people who have known me nearly all my life, including myself.) Now I hope to become skilled enough in the language to become an interpreter. This has been a wonderful, unexpected journey that I’m glad I’ve been on for the last two years. While learning about the wonderful culture and language, I’ve also learned a lot of other life lessons while learning this language. 2. I’m a perfectionist, never wanting to make an error. But…Life is full of mistakes, just like the process of learning a second language. I’ve learned that it’s okay to mess up. It’s okay to make an error. It’s okay to make language bloopers! If I mess up while trying to sign something, it’s okay to acknowledge them, have a good laugh, and to learn from them. For example - last semester I was trying to tell my ASL teacher, Nancy, that I was feeding my aunt’s cat while she was away in Hawaii. Instead, the way I signed it came across completely different than I intended. Nancy’s face when from a shock and horrified expression, causing me to wonder, “Oh no…What did I just say? ?” Turns out, I told her I was eating my aunt’s cat…not feeding it!! (It’s amazing how one direction and movement of a sign can change the whole meaning! Oops!) While I felt slightly embarrassed, Nancy and I just sat in her office laughing about it and months later it’ll still be brought up as a joke. The error caused a good laugh, but more importantly? I took my mistake as a great learning experience and am now very aware of how to sign that I am feeding an animal, or person, without saying I am eating them. 3. Learning ASL has taught me to focus. It has taught me to focus on the person I’m in front of, to fully dedicate myself to the moment I am with my Deaf friends or in my ASL classes. Instead of pulling out my phone to check for text messages, I am intentional and I focus. For example…Let’s say that I’m with a group of Deaf friends. If I pull out my phone to check for messages and I take the time to respond, I’ve probably just missed a good chunk of what my friends are trying to tell me. Learning ASL has taught me to put my phone – and any other distractions – away. It has taught me to prioritize the moment I’m in and the person I am with. 4. I’ve learned to ASK questions!! Although I have a good background of ASL classes, I am not fluent. I’ve learned that if I don’t understand something – I need to ask for my friends and teachers to repeat what they’ve signed. If I don’t catch their fingerspelling, I need to ask them to repeat it and to slow down. If I don’t understand a sign, I need to ask for the sign’s definition. Learning that it is okay to ask questions has made a big impact in my life. I’ve noticed that this new habit even transfers to my other classes, like math. I’m no longer timid or shy on asking for assistance in understanding things. After my teacher repeated what she told me, I realized I did catch all that she told me and understood everything…everything but the fingerspelling of the word “pump”. Her pool pump is the cause of her pool problems. The more I interact with those who are Deaf, the more I am trying to become aware of my signing and processing habits, and the ones I need to keep – or break. 5. Number four basically plays into number five. Learning ASL has taught me that I shouldn’t assume what someone is telling me. If I’m not sure, I need to ask questions. I need to seek clarity. 6. Learning ASL has taught me about worship. Again, I’m not fluent - yet. I’m not yet an interpreter. However, when Sunday morning comes along and I find myself sitting in a church pew as the worship team leads the congregation into a song, I often find myself thinking instead of singing. I don’t know a lot interpreting music, but I do know you have to understand the meaning to have the ability to interpret what is being said, or what is being sung. Sometimes I allow myself to get intimidated by others and how superior their signing skills seem to be compared to my own. Yet, this year especially, I’ve been reminded that we are all just students. They don't have all the answers and neither do I. My classmates have their strong spots, but so do I, and I shouldn't knock myself down because I have yet to learn something. We all start somewhere, and we each have our own journey. 8. I’m never going to stop learning. I mean, I already knew this. But as I continue in my ASL classes, headed towards my interpreting career goal, I am reminded of this almost daily…and I’m okay with this fact. 9. I can make all the life plans you want, but I need to stay flexible. I was planning to live overseas. I was planning to be a journalist. I really thought that's what God was guiding me to do. While I do feel as though I will continue to go overseas to do short-term mission trips, for now I feel like my place is right here at home in America. God still has me around another culture, I just didn't expect Him to place me in one so close to the comfort zone of my own front door. Maybe God will guide me overseas later on in my life…but maybe not. Either way - I'm staying open to the idea, I'm staying flexible. 10. Step out of your comfort zone! I'm reminded to do this when I travel. But when you travel, you often expect to step out of your comfort zone - and doing so is practically impossible to avoid. Learning ASL has helped me step out of my comfort zone within my own country's borders…within my own city. Giving a presentation in front of a class, using language different from my mother tongue? Going to events where I have yet to know anyone else who is attending, and who speaks a language that you are only just beginning to learn?? Those are only two examples (out of many) of how learning ASL has been teaching me to step out of my comfort zone - and I'm glad that learning another language reminds me to do this on a constant basis. These are just some of the lessons I've learned throughout the last two years and I know I'm bound to learn a lot more. When I signed up to take my ASL 1 class, I never expected this journey. I thought, "I'll take ASL 1 and 2 for my language requirements and that's it." Little did I know that I'd be sticking around for a lot longer (as in a life commitment), and that taking ASL 1 would guide me through a new and extraordinary door. Are you learning another language? What lessons have you learned through your journey?? Today is April Fool's Day. It's a day in America where pranks and jokes are taking place throughout the whole day. It's a day when you can't trust anyone, and any bit of news is unreliable - especially online. (You know. It's just like what Abraham Lincoln once said, "You can't trust everything you read online!"…Right??) It's a day when doubt plants itself in every moment of that specific day, not know which moment or set of information we can accept as fact. I love jokes. I enjoy a good prank. I didn't see or hear many jokes this year, but out of the few I heard, my favorite one was created by a child in kindergarten at the school where I work. It was lunch time and my coworker was talking to a 5-year-old boy while helping him put his straw into his milk. He told my coworker, "I had eggs for breakfast!" Replying, she told him, "good!" Then, with excitement, he said, "APRIL FOOLS!!!! I had sausage." He was so proud that my coworker believed him when he told her he ate eggs for his morning meal. He was probably even more excited that he tricked an adult. Most of the other jokes I saw were on Facebook. A friend of mine tricked her daughter when they gave her a muffin package. Their young child was sourly disappointed when they opened the package. They were expecting a sweet and tasty muffin inside...just to find some celery. The child's reaction was hilarious and the video received nearly 50 likes on her parent's Facebook page by the end of the night. Then, I saw a few people post something I see every year - at least 5 times. Something that they claim as "fact" for the first few hours of their original post to later claim is as a joke. Yet, it's a joke that I don't find to be funny. I didn't like it last year…and I still don't like it this year. (I just finally decided to voice my opinion.) But most of all? It's a joke that I wish others wouldn't make. It seems simple. It seems harmless. For many women, this "harmless" April Fool's joke is quite the opposite of being considered funny. Sure, it can be funny to those who have children and find no struggle in getting pregnant. It's easy for this joke to be funny to those who have never cried out to God while spending hours on their numb knees, asking God to bless them with at least one child…for those who have never spent hours at the doctor's office talking about fertility, fertility treatments, and saving thousands of dollars to spend on hopes of uncertain medicine to assist in the process. The joke may cause laughter for those who have never had the heart-wrenching moment at 2:00 a.m. of an ER doctor saying, "You're in your second trimester…but I can't find the heartbeat of your daughter." Unless you have certain life experiences, it is probably easier to have a good laugh over things that cause others tears. There is a great amount of (often forgotten) women out in the world who have a constant struggle when it comes to the topic of children and pregnancy…Women who are mourning every day for an unfilled desire. Jokes like this are a fresh cut on an old wound…A wound created through experiences of miscarriages, giving birth to a stillborn, child loss, infertility, and even the struggle that some experience during the process of adoption. When women, who have no problem conceiving children, who have never experienced the unforgettable and never-ending heart ache from child loss or infertility post, "I'm pregnant…again!!" as a joke…it's not even slightly funny. Every day many women are reminded of what they don't have or about what has been taken away from them. When women who have children and an easy ability to conceive children, and then they joke about having another child - when they aren't really pregnant - it is another reminder. They can't have children, yet their friend with a house full of children has such an easy time that they can joke about it. The woman with a household full of children is lucky. She is blessed as she has been given such an amazingly beautiful gift from God. The women who have struggled with child loss and infertility? They are thankful. They are thankful that their friends have their children. They are thankful that not every woman has to battle their type of harsh struggles of motherhood. Their journey is something they would never wish upon another woman. small things. They're reminded in the comfort of their own homes while they surf their TV and pass the drama-filled TV series Teen Mom. They are reminded when they go to a mall and pass the baby stores or the baby isle in Target wishing they could the cute frilly pink dress for a little one. They are reminded when their friends announce real pregnancies and are invited to an endless amount of baby showers - all while craving the ability to have their own celebration for their unfulfilled desire to hold a child of their own…Not to mention when they are reminded on the date of their child's birth, the date of their death, on Mother's day, and on Christmas. They are reminded when they go to place flowers on the gravesite of one of the few things that have their child's name in writing, the headstone of the local cemetery. They're reminded of their loss and struggle by the dusty stored boxes from their time of hope and joy, before that time unexpectedly ended in an indescribably, paralyzing pain. It's okay to make jokes and to perform pranks on April Fools. But please - keep in mind that your posts are seen by all on your friend list. What may be seen as harmless to you can hurt another in ways that you (hopefully) will never understand. Your posts are seen by mothers, fathers - but also by the childless. I've never lost a child of my own. 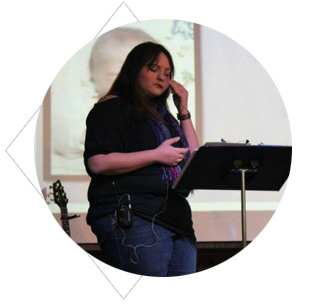 I've not dealt with infertility - and I pray I never will…But I know so many who have - including my sister who gave birth to first child, to her daughter, Ashley, as a stillborn (read Going Home for the story from my perspective). Knowing how much it hurts me, just as an aunt of a child who has passed on, for people to make light of pregnancies and the reminder of the pain my family has gone through throughout the last two years since her death…just to see someone be so flippant...I know I can't even imagine the pain my sister must feel - especially when people know her story and that she sees all that they post. Sure, time has passed since the death of my niece. July 5th will mark the 3rd year anniversary of both her birthday and the day she died...But it is still a sensitive topic for my family. Our hearts still ache and our memories often feel as though they just took place yesterday…Memories from the few short moments when we all held her for the last time (and in my case, it was the first and last time since I was abroad during her birth). Please…Think before you post. Your words - written or spoken - do impact others around you.